The phrase, “Sometimes, dead is better,” is plastered over every advertisement for “Pet Sematary,” based on the novel by Stephen King of the same name. Ironically, the filmmakers did not head this warning and decided to revive an idea that should have been left alone. After a family moves into their new home, they discover a pet cemetery on their property. As the family’s stay in their new home continues, they begin to discover the true powers that the burial ground holds. Sounds pretty cliché, right? Well, it is. King’s novel is supposed to be a psychological horror story whereas the film has brief and blundered elements of that, but it instead favors to go with the most generic horror story handling one can think of. The story of “Pet Sematary” follows Louis Creed (Jason Clarke) as his mind begins to unravel with the tragedies that befall him and the power that the burial ground provides. While writing the book, King knew how to do this effectively: make it a slow burn and a gradual descent into madness. The film rushes through everything, resulting in little time for Louis’ madness to feel genuine. On top of that, the film inexplicably decides to have Louis’ wife Rachel (Amy Seimetz) also be a little crazy by having her see things that are not there. Not only does that form of madness not correlate with what the story is trying to do, it does not feel appropriate for the film. It would work for a haunted house movie, but not a trying-to-be psychological horror film. It should not be surprising that “Pet Sematary” was unable to pull off psychological horror, because it fails to pull of horror in general. The film gives the audience nothing to be frightened of because it shows off everything right away. Before the movie even gets started, the audience knows what is going to happen. Not only does the opening shot of the film show its ending, but there were “Pet Sematary” trailers that showed off the entire story. Why be scared of what might happen when one already knows what will happen? The only way the movie might be able to pull off some scares is from the creepy visuals or the situations that the characters are in, but that does not happen either. The set design for the scary locations is super cheesy-looking and the things that Rachel is seeing throughout the movie are in her mind and not real, so they cannot harm her. To reiterate, there is nothing scary in this horror movie. By the way, horror should have about fifty quotation marks around it. In short, the movie is not scary. It is not interesting or creative either. The characters in the film, while well played by their actors, are not very interesting or well-developed. Louis is a flat-line of a character whose only real defining characteristic is that he loves his family, Rachel is given a backstory, but it is only used for cheap jump scares, and Jud (John Lithgow) is rushed into the story and tossed into the family’s life in a forced and unbelievable way. Sure, adaptations of Stephen King’s work, with a few exceptions, tend to not be that great, but at least they usually capture some amount of his atmosphere or creativity in the work. 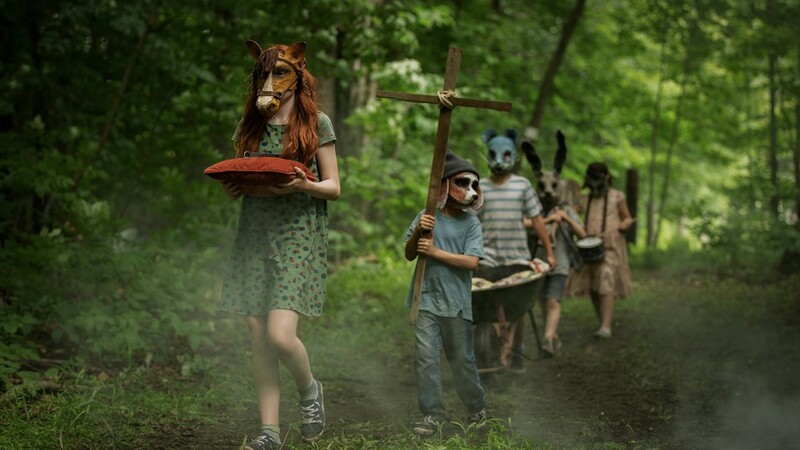 “Pet Sematary” does none of that by just taking the premise and handling it in a generic manner. When the only Stephen King-esque trait someone includes in their Stephen King adaptation is a terrible ending, that is a really bad sign. It is especially bad here because the movie is already bad and lackluster, so just imagine how awful the ending must be. Here is a hint: it is terrible. “Pet Sematary” is a poorly paced, badly written and not scary horror film which raises the question, why make a film adaptation of “Pet Sematary” if the filmmakers clearly had no interest in making a movie that captured what made the novel good?